The Hunting Accident is the true story of Matt Rizzo, born on the West Side of Chicago in 1913. At 18 he found himself blinded and arrested after a botched armed robbery, placed in Statesville prison right next to infamous murderer Nathan Leopold. Told from the perspective of his son Charlie who learns his father’s story only after getting into some similar trouble as a teenager, The Hunting Accident is a moving account of a strange life; one that hooks into the mind, pulling it forward into the unbelievable truth with a stimulating mix of fact, embellishment, poetry, and confession. Blair's illustrations move fluidly between reality and day dream, often conveying not only movement and actions but visual representation of emotion. Bonus: insight into one of the biggest murder trials in Chicago history. It was a hunting accident—that much Charlie is sure of. That's how his father, Matt Rizzo—a gentle intellectual who writes epic poems in Braille—had lost his vision. It’s not until Charlie’s troubled teenage years, when he’s facing time for his petty crimes, that he learns the truth. Newly blind and without hope, Matt began his bleak new life at Stateville Prison. But in this unlikely place, Matt's life and very soul were saved by one of America's most notorious killers: Nathan Leopold Jr., of the infamous Leopold and Loeb. From David L. Carlson and Landis Blair comes the unbelievable true story of a father, a son, and remarkable journey from despair to enlightenment. David L. Carlson has been a filmmaker, musician, car salesman, experience designer and is the co-founder of Opera-Matic, a non-profit street opera company in Chicago. 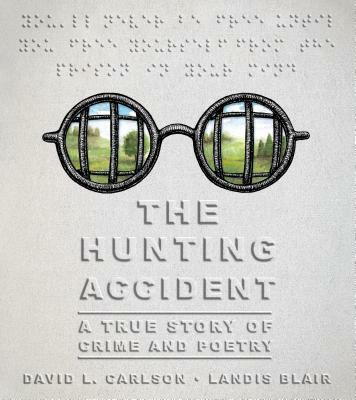 The Hunting Accident is his first book. Landis Blair is a pen and ink illustrator, known in the Chicago independent comic scene for his cross-hatched drawings and delightfully morbid picture books. He is currently based out of Los Angeles, California. His books include The Trial: A Choose Your Own Kafka Adventure and The Hunting Accident.